I am a grammar nazi, a trivia freak, and a lover of fine metal music and calculus. I also play nearly every brass instrument proficiently, and I sing Lead/Baritone in a local barbershop chorus. EastsideRock Thoughts on Liliana's Triumph ? April 18, 2019 10:45 a.m.
Dakmor Salvage is really good with Raven's Crime , definitely worth taking a look at. April 16, 2019 2:17 p.m.
April 16, 2019 9:33 a.m.
Hey guys, we achieved #1 position in Jank EDH yesterday! April 15, 2019 11:04 p.m.
April 15, 2019 3:52 p.m.
Zimmers_0 Rampaging Baloths is free 4/4's, whereas Oketra you technically have to pay for. It's generally easier to get value off of Baloths, because you will be able to activate it more in the right deck. In addition, Rampaging Baloths counts lands you cheat into play, whereas Oketra does not. 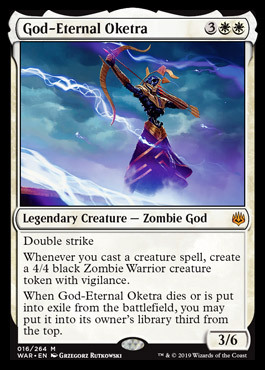 I would be more inclined to like Oketra if she said whenever a nontoken creature enters the battlefield. Also, >. April 15, 2019 3:31 p.m.
April 15, 2019 2:24 p.m.
April 15, 2019 2:23 p.m. Whenever you cast a creature spell, create a 4/4 Zombie Warrior token with Vigilance. April 15, 2019 2:17 p.m.
Villainous Wealth seems really good. April 15, 2019 10:21 a.m.
Rzepkanut In my Atraxa counters deck, by the time I'm hitting 7 mana, I'm probably winning the game, so it's not that good for me. I think at it's playable, but 7 mana is a bit much for its effect imho. April 15, 2019 8:28 a.m. Edited. Probably overcosted for its effect _Delta_. April 14, 2019 8:01 p.m.
Huh. That sounds.... interesting. I don't think it's worth the cost sadly. April 14, 2019 7:39 p.m. 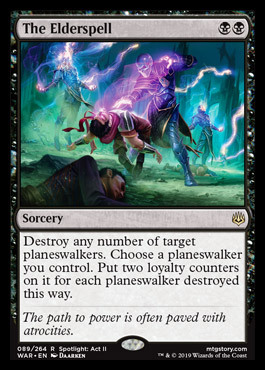 Since you are going with a token route, Path to Exile is going to be a really good ramp effect for you. April 14, 2019 7:38 p.m. Pain! But On A BUN!!! April 13, 2019 10:20 p.m.
April 12, 2019 2:24 p.m.
April 12, 2019 10:05 a.m.
April 12, 2019 10:01 a.m.
Daedalus19876 some more eagerly than others. April 11, 2019 6:33 p.m.
Deceit isn't the word I would use for . Maybe something more in the spirit of orzhov, Oppression maybe? April 11, 2019 6:14 p.m.